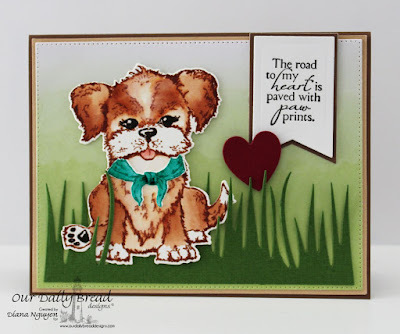 For this week's Color Challenge at ODBD, I went for the teal and browns - perfect colors for the sweet puppy from this month's September release You are Pawesome. I stamped him with Distress Inks Tea Dye and then watercolored him with the same inks but diluted for different shades of brown. I let him play outside in a crass scene created with the grass border die, some soft green watercolor paper die cut with Splendorous Stars pierced border die. I also added a heart from the Ornate Hearts Dies. This month we also have a guest designer on our challenge team: Julie Gearinger! I hope you get a chance to stop by their blogs and leave them some love. Chris, Julie, Paula, and Robin. To see all the projects created for this challenge or to join in the fun click here. You have until September 13, 2015 at 8:00pm EDT to join us. By participating in the challenge, you have a chance to win a $15 ODBD Gift Certificate good towards the purchase of stamps in the “stamps column” on the ODBD website, or to be spotlighted on the ODBD Blog at our next challenge. The random prize winner will be posted on our next challenge post. Please do not post on Flicker as many of us do not have the ability to comment on your cards nor can we spotlight your cards on the blog. Oh,I love your sweet card using the colors and the new stamp set!! The dog in the set looks sort of like your Kiki :-) Kiki is so cute wearing her hand-me-downs- what a great idea!! So thrilled to be designing with you at ODBD and SNSS - hugs and God Bless! Aw, Kiki is darling Diana!! Your card is beautifully done Diana!! Your coloring of the dog is so sweet!! Great design with the sweet sentiment, banner and heart!! Love how you made it a scene. What a cute little dog you have Diana! 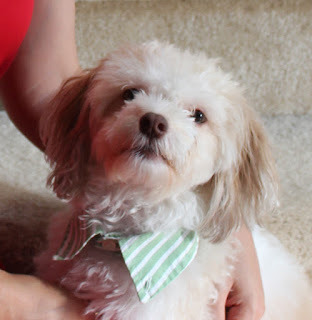 Gosh, love the little collar! Your card is absolutely adorable too!! That sweet little puppy and the heart...they go together for who can have a dog and not think of pure love! (I'm so a dog person! I have 2 outside cats but cats are in-love with themselves IMO). My dog would like to play with your dog...she is big but she is the sweetest thing and so gentle! Sweet card Diana!! Love how you colored your little guy! Ah, Diana, how precious! Your real Kiki is darling, and they do change in color once trimmed. But what a precious card! It must have been extra fun to color because of your love of dogs! Hugs! Awe, what a sweet pup on the card and in real life!!! I agree, there is something really special about how a dog loves!!! Mine is my constant companion and buddy!!! I really like your watercolor background and the sweet little heart die cut too!!! Such a sweet card!!! Two wonderful puppies, one real and one on a card. Kiki looks very dapper in his collar. The card is just wonderful, and every component is perfect. As I am visiting the blogs for today's posts, my ODB wish list is growing. Thank you for sharing.